The Pathology Interest Group ("PathIG") was initiated in academic year 2013-14, and is designed to inspire and educate the next generation of leaders in pathology and laboratory medicine. The PathIG program was created to educate medical leaders on the various roles in Pathology and their impact on the medical field, and to offer a venue for UCLA medical students interested in Pathology to explore the field further. The PathIG hosts informative sessions with guest speakers, microscope review sessions, shadowing opportunities and research fairs and mixers. PathIG opens each academic year with a luncheon that serves as an introduction to pathology, featuring an informal round table discussion in which UCLA pathologists covering a variety of roles discuss their daily research, education and clinical activities. The second event is an introduction to dermato pathology (in collaboration with the Dermatology Interest Group) - a field within pathology that appeals to many students. During the year, microscope sessions supplement the medical school curriculum by providing interested students with the opportunity to go through the paces of a pathologist as a they utilize the power of multi-head microscopes in small group sessions; these have become so popular they have to be repeated several times to accommodate all interested students. Shadowing opportunities are also offered throughout the year, wherein students follow UCLA pathologists to get a better grasp of their daily activities. At the annual Pathology Research Fair, faculty present a brief overview of their studies and then students can approach them to learn more about specific projects and opportunities to join their research group. The 2018 PathIG Speaker Series took place on September 13, 2018 with Drs. Peggy Sullivan, Dawn Ward, Jonathan Zuckerman, and Elena Stark on "Pathology as a Specialty." A second session "Introduction to Dermatopathology" followed on September 27, led by Drs. Peter Sarantopoulos and Greg Gates. These talks discussed the field of pathology clinically as well as its importance in research and education. Both highly successful events were attended by first and second year medical students. As one of the students stated, "During our first year of medical school, we learn about the normal and abnormal histological findings; these talks are helping me understand how to translate my enthusiasm in histology lab to a future career." Several multi-head microscope sessions with Dr. Bita Behjatnia have taken place in academic year 2018-19, to review material pertinent to Blocks 8 and 9. 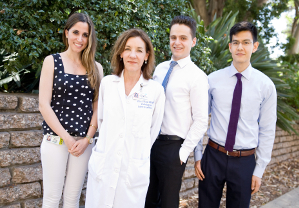 Other events this academic year have included Dermatopathology and Dermatopathology Shadowing with Dr. Chandra Smart, shadowing with Dr. Goldstein, and a new Shadowing Program at Harbor with Dr. Kene Ojuwku, for first- and second-year medical students. One of our participants wrote, "I really cannot overstate how much I enjoyed this shadowing experience. It validated my interests in pathology." We congratulate our participating faculty as well as all the student coordinators, on this excellent kick-off to the program.